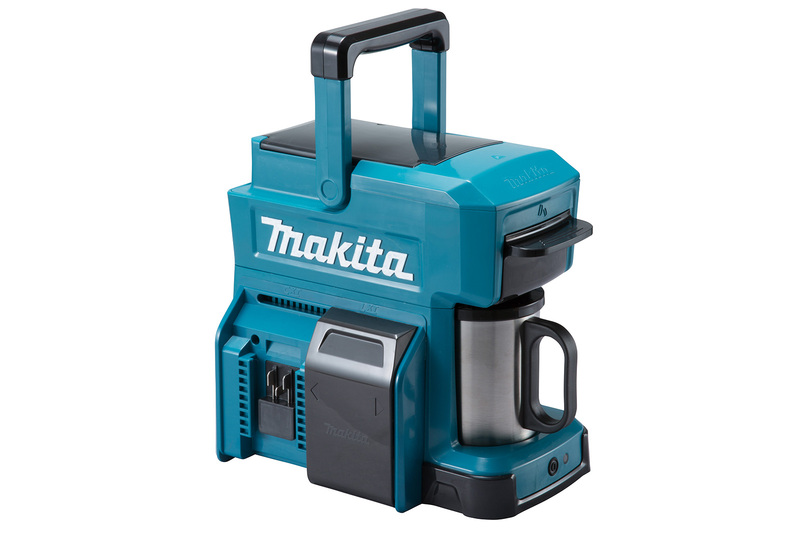 The new Makita cordless coffee maker is expected to become the most prized possession of all construction trades and outdoor contractors. The DCM501Z coffee maker is compatible with both CXT and LXT Makita Lithium-Ion batteries and features dedicated battery ports. Weighing just 2.2kg, with an 18V Makita battery, and complete with carry handle, the DCM501Z can brew 260ml of coffee on a single CXT 10.8V – 12VMAX battery or a 3.0Ah 14.4V battery; 320ml of fresh coffee on an 18V 3.0Ah battery, and up to 640ml of coffee on an 18V 6.0Ah battery. The coffee maker comes complete with a dedicated cup, with capacity of 240ml coffee, and is designed to fit in the machine without leaving a gap so protecting against splashing or entry of dirt and dust. Commercial cups up to 90mm high will also fit the machine. The DCM501Z is compatible with ground coffee as well as 60mm coffee pods for the most delicious brew. Dependent on battery type and voltage a fresh 160ml cup of coffee can be brewed in just five minutes. This coffee maker features a cover to protect the empty battery terminal and a boil dry function prevents the machine from burning out, so if the water empties and the temperature inside increases, the integral sensor will turn off the power supply automatically.